Recruiting a new employee for your team can be a time consuming exercise, particularly if you are a small to medium business and don’t have the support of a HR person or team to assist you. One of the most time consuming elements is interviewing short listed candidates for your position, and to do this thoroughly it’s easy to lose hours from your day. I sit in on lots of interviews with business owners and managers and always find that so many of them don’t invest the time in preparing interview questions prior to the interview. I’m a firm believer that it is very important to have pre-prepared interview questions and it’s why we include it as part of our recruitment service. The best and most effective interviews are a two-way process. It’s not just about you interviewing the candidate. The candidate also needs to have the opportunity to interview you to see if the role and the business is the right fit for them. You can let the interview flow and not be too structured as well as keeping it to more of a conversational style even if you have prepared interview questions. What I’ve found can happen when you don’t have interview questions to follow is that it is much easier for the interview to get off track. I’ve seen on many occasions an interviewer prefer a candidate because of the connection they built with the candidate, not necessarily because of their skill set. It can be easy to get caught up in a conversation with someone you connect with and lose focus on the actual skills you need for the role. Recruiting someone we like or someone like us is an easy trap to fall in to when you don’t have interview questions prepared that focus on the skills and expertise required to do the job. Having interview questions will also help you weed out the people who can talk the talk but can’t walk the walk. Have you ever interviewed someone that has the gift of the gab? If so, you’ll know that it is easy to fall in to the trap of thinking they can do the job just because they can talk the talk. 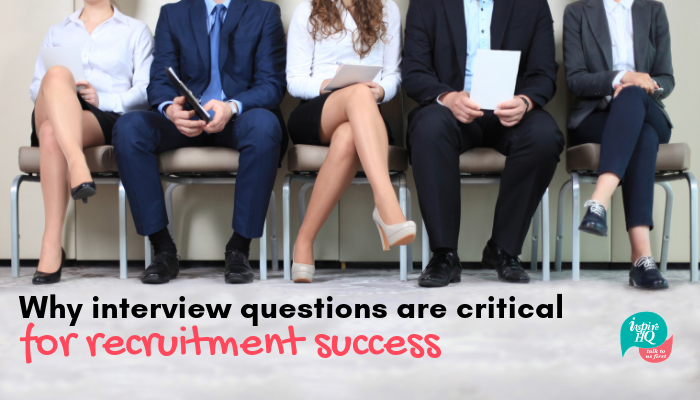 With structured interview questions you’ll probably quickly identify that they may not actually be answering the question but are dancing around it with a lot of fluffy answers. Just because you use interview questions doesn’t mean the interview has to become rigid and that you can’t probe in to answers from the candidate. The questions are there to follow as a guide and as a checklist to ensure you cover all the skill set and culture elements that are important for success in the role. If a candidate is responding to a question and it leads in to another question that you have later in the interview process it is ok to probe and jump around with the order of your questions. This is when you’ll uncover the gold that you want, to be able to make the right decision. Another crucial reason for using interview questions is to ensure that you don’t end up doing the majority of the talking. Interviews can be nerve-racking even if you are the interviewer. What can happen when we don’t have interview questions is that the interviewer can end up doing the majority of the talking and the wording of the questions can sometimes not be structured effectively. For example, I often hear interviewers say “so you’ve got great time management skills right?” or “can you communicate with difficult customers?” (or insert which ever skill set you are trying to assess). The problem is when we phrase the interview questions in this manner it is only natural that the candidate will respond with a yes. The better way to phrase the question to get a more useful response would be to ask “tell me about……” Using this style of interview question makes the candidate demonstrate their skills. Having prepared interview questions will stop you falling in to this trap. The other important reason to prepare interview questions is to protect you from a discrimination claim. Without set interview questions how can you prove that you didn’t discriminate during the interview process? Interview questions with notes taken during the interview will be evidence that you ran a discrimination free process and that the best candidate was selected on the key selection criteria required for the specific job. Having prepared interview questions will significantly improve your ability to pick the right person for the job for the right reasons.